This very nice image of Alexis de Tocqueville (with signature) comes from a 1896 translation of his memoir or "recollection"' of the 1848 Revolution in France. It is described as a "heliogravure" which is a form of photogravure whereby a copper plate is covered by a light sensitive sheet which has been exposed to the image and then etched, leaving a precise reproduction. In the picture Tocqueville looks to be the right age (about 43) for this to be an image taken at about the same time as the events discussed in his "recollections". In the accompanying essay we display this iamge with a quotation from the Recollections about the first day he sat in the Constituent Assembly in May 1848. Alongside this we also have a similar picture of and quotation from Frédéric Bastiat who was also a Deputy in the Constituent Assembly. My dear Cobden, it is impossible for me to write to you in any length. Besides, what would I say to you? How can I foretell what will come out of an assembly of nine hundred people who are not restricted by any rule or precedent, who do not know one another, who are under the sway of so many errors, who have to satisfy so many just and illusory hopes, and who, in spite of this, have difficulty in listening to each other and debating because of their numbers and the huge size of the hall? All that I can say is that the National Assembly has good intentions. A democratic spirit reigns there. I would have liked to say as much of the spirit of peace and nonintervention. We will know the outcome on Monday. This is the day set for discussions on Poland and Italy. In the meantime, I will go straight to the subject of my letter. You know that a workers’ commission used to meet at the Luxembourg Palace under the chairmanship of M. Louis Blanc. The presence of the National Assembly dispersed it, but it was quick to set up a commission responsible for carrying out an inquiry on the situation of industrial and agricultural workers and suggest ways of improving their lot. This is a huge task, which the current illusions are making very hazardous. I have been called upon to take part in this commission. I was fairly nominated, after I set out my doctrines frankly, but above all from the point of view of property rights. I am having printed what I said, which succeeded in having me nominated, in an article entitled Property and Law, which will be appearing in the next issue of Le Journal des économistes. Please read it. I now want to use this inquiry to bring truth out into the open. Whether I am right or wrong, we need the truth. In France, we do not have much experience of the machinery known as a parliamentary inquiry. Do you know of any work which describes the art of organizing these inquiries so as to reveal the truth? If you know of one, please let me know, or better still send it to me. Anti-British prejudices are still far from being extinguished here. People think that the English are devoting themselves on the continent to countering the republican policy of France and I would not put this past your aristocracy. For this reason, I will be following with great interest your new campaign in favor of political and economic reform, which may reduce the foreign influence of the squirearchy. Source: Frédéric Bastiat, The Collected Works of Frédéric Bastiat. Vol. 1: The Man and the Statesman: The Correspondence and Articles on Politics, translated from the French by Jane and Michel Willems, with an introduction by Jacques de Guenin and Jean-Claude Paul-Dejean. Annotations and Glossaries by Jacques de Guenin, Jean-Claude Paul-Dejean, and David M. Hart. Translation editor Dennis O’Keeffe (Indianapolis: Liberty Fund, 2011). Chapter: 98.: Letter to Richard Cobden. </title/2393/225775/3707073>. ... The National Assembly has met. What will come out of this blazing furnace? Peace or war? Fortune or misfortune for the human race? Up to now, it has been like a child who stutters before speaking. Can you imagine a hall as big as the Place de la Concorde? In it, there are nine hundred members debating and three thousand onlookers. To have the opportunity of making yourself heard and understood, you have to utter high-pitched shouts accompanied by very emphatic hand movements, which rapidly result in an outburst of unreasonable fury in whoever is speaking. That is how we are conducting our internal proceedings. This takes up a lot of time and the general public does not have the common sense to understand that this waste of time is inevitable. 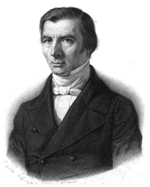 Source: Frédéric Bastiat, The Collected Works of Frédéric Bastiat. Vol. 1: The Man and the Statesman: The Correspondence and Articles on Politics, translated from the French by Jane and Michel Willems, with an introduction by Jacques de Guenin and Jean-Claude Paul-Dejean. Annotations and Glossaries by Jacques de Guenin, Jean-Claude Paul-Dejean, and David M. Hart. Translation editor Dennis O’Keeffe (Indianapolis: Liberty Fund, 2011). Chapter: 99.: Letter to Mrs. Schwabe. </title/2393/225777/3707083>.